Come to Open Gaming Weekend! ManaSlam tapped out, but Open gaming enters the ring! So, what happened? Advance registration for ManaSlam was really low. As organizers, we had to make a choice whether to run or not. We knew that low turnout would mean a disappointing event, and incurring significant more expenses. So, we made the hard choice to cancel. But whether we ran or not, the cost for the hotel was going to be incurred either way. So rather than let that just sit empty and unused, we're throwing a game party! 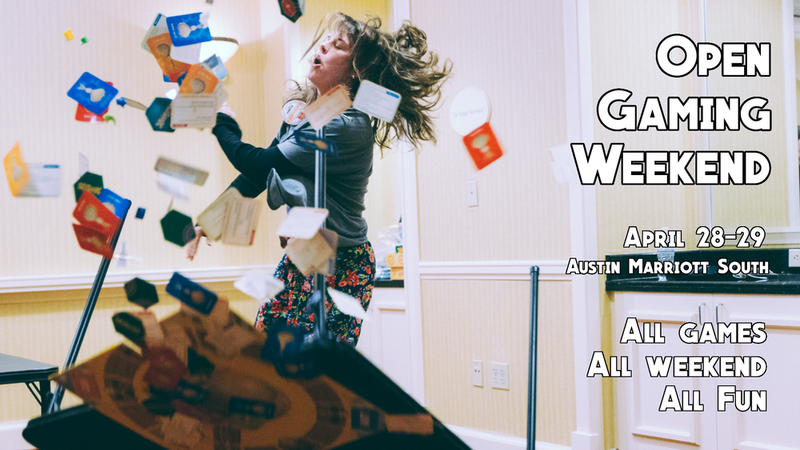 From 9 AM Saturday April 28 to 9 PM Sunday April 29 at the Austin Marriott South, we'll have a ballroom of tables ready for you to play some games! What happens at this is up to you, because we'll play whatever you want. There's an RSVP form below, which will help us plan and where you can make requests. But don't feel the need to fill that out if you don't want to. What are some requested activities? Play board games! We'll bring out some selections from the Board Game Bash library, or feel free to bring your own bag of games! Play Magic! We've got a bunch of cards, so why not play? We'll run drafts at cost ($8 for three pack drafts, or $15 for sealed), free constructed, Commander, whatever. We'll even find some prizes to give. And if we get 16 people in to play Modern, we'll give away the championship belt! Play Dungeons & Dragons! There will be round tables that can seat up to 8 to play some D&D. We may even have some special games from Role Play Rally you can try. Learn a new game! Ever wanted to learn Magic? We'll have free decks to give. Make a D&D character? Someone can teach you! Try a board game? Jump onto a table! Con merch fire sale! I purchased a bunch of playmats and shirts for ManaSlam, so get them on the cheap. They're pretty cool shirts, and are super comfortable. And while we're at it, let's go ahead and put other con merch on sale. Why not? Grab a game bag, some dice, D&D pins, and more! Custom Magic buttons! We'll bring our button maker and turn Magic cards into buttons. For a $1 donation, we'll turn your card into a 1.25" button you can wear. Don't have cards? Feel free to pilfer our boxes of commons and pick one out. Actually, we'll turn anything you want into a button. Playing card thickness or thinner can be made into a button. Minis painting! I'll bring out my paints and brushes, you bring the minis. We'll set up a table with some newspaper or plastic and you can go to town painting your little figure. Have fun! More than anything else, this will be a chill, fun time. Come hang out with fellow gamers, maybe try something new, and whatever else! Plus, April 28 is International Tabletop Day, so this is a perfect way to celebrate with all colors of tabletop gaming! Click the image for our Facebook event! The Modern Champion belt, and the too sweet ManaSlam shirt made for the con. Custom buttons made from Magic cards! Your weekend at ManaSlam will be unforgettable, fun, and engaging. We provide an inclusive environment where everyone can be themselves and enjoy the gaming community. All attendees, volunteers, judges, and exhibitors are bound by a Code of Conduct which includes a duty to be open and welcoming. Like ManaSlam? Want more gaming? Check out our other gaming events. Board Game Bash is 51 hours of non-stop board games, every August. MegaGame Texas puts on day-long, interactive games for dozens of players. Public games every other month, and private bookings available. Role Play Rally is a weekend of Dungeons and Dragons 5th Edition, twice a year in January and June.